*I didn’t have yogurt so I used 3/4 cup sour cream and 3/4 cup milk. 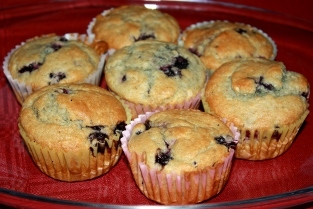 Line a muffin tins with muffin paper or generously coat with vegetable spray. Whisk the yogurt and eggs in a medium bowl. Gently fold together with a rubber spatula until well combined. Add 1 cup of blueberries or raspberries or chocolate chips etc if desired. Use a large ice cream scoop or a measuring cup to divide the batter evenly among the muffin cups. Bake until golden brown and an inserted toothpick comes out clean 25-30 minutes. Let them cool for 5 minutes and then flip them out to cool on a wire rack. 4 Responses to "Gluten Free Muffins"
Have you ever made these with just milk? Instead of the yogurt etc as I could only use rice or hemp milk. Do you think that would change them at all? I can’t remember all the different allergies you all have, but I’ve seen coconut yogurt, almond yogurt, and soy yogurt. I had NO IDEA there was rice yogurt! Do you know where they sell it??? We can’t have coconut, almond or soy. Jade is severely allergic to coconut, Jade and I are both severely allergic to almond and I am allergic to soy… If I only had to cook for one person it would be easier but cooking for all three of us with different allergies it gets more difficult. these stores maybe your husband can check out Whole Foods next time he’s in that area!